RBTH looks at Russian sport clubs owners and how they invested in sports clubs around the world. Another Russian investor has invested in world sport: This month, businessman Oleg Tinkoff became the owner of the Danish highway cycling team Saxo Bank. "I am very proud that I finally have a team of the World Tour and the world's best racer, Alberto Contador. I look forward to great success in the future, " Tinkoff said. The team will change its name to Saxo-Tinkoff. Tinkoff is not the first Russian businessman to own a leading sport clubs outside of Russia. RBTH takes a look at the most famous examples of investments of Russian businessmen in the development of world sport. Top 10: Which businesspeople does the Russian public like? Roman Abramovich started the fashion for the acquisition of sport clubs shares. 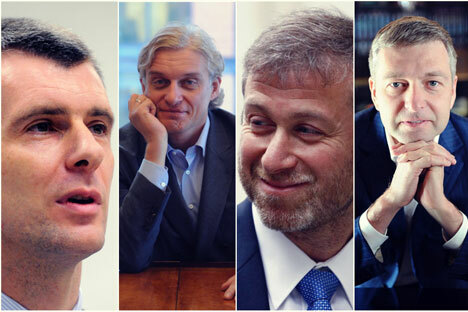 Ten years ago, the Russian billionaire the London football club Chelsea. At the time of purchase, "blue" were in the middle standings of the English Premier League. The team had a few bright names, but financial affairs were bleak. Buying Chelsea for £140 million, just over $210 million, was a very small sum in those days for an English Premier League club. In that first summer, Abramovich spent more than £100 million purchasing layers. For 10 years, the cost of transfers of the club became closer to a billion pounds, and the owner of spent another billion pounds on the salaries of players and coaches, and the construction of a new training base. The club performed well under Portuguese coach Jose Mourinho, who coached the Chelsea from 2004 to 2007. After Mourinho left for Inter Milan, Abramovich changed nearly a dozen coaches, but none of them, including the venerable Carlo Ancelotti and Guus Hiddink, met the demands of the ambitious club owner. As a result, Abramovich returned to the roots: from July 2013 Mourinho came again to the Chelsea’s helm. Under Abramovich the London club became the best in the national championship three times and won the Champions League in the season 2011-2012. In that season for the first time the club registered a profit and came in fifth place in the list of the richest football clubs in the world, giving way only to the Real Madrid, Barcelona, Manchester United and the Munich Bavaria. Russian billionaire Mikhail Prokhorov purchased 80 percent of the New Jersey Nets in May 2010. The businessman promised to lead his club to the top, even though it ranked at the bottom of the NBA at the time of purchase. Prokhorov did not disappoint the expectations of experts: compared with 2010, the Nets have improved both its standing and its financial performance. After opening the Barclays Center arena in Brooklyn in September 2011, the team moved to New York City and changed the corporate colors, as well as its name to the Brooklyn Nets. The new, spacious arena helped to increase attendance at home matches by 53 percent, and increased TV ratings of Nets games. Prokhorov’s team now has a growing army of fans. Despite the fact that the most popular basketball club of the Big Apple remains the New York Knicks, the Brooklyn Nets are not far behind. Prokhorov incurred unprecedented costs to achieve the teams success on the court by adding stars such as Kevin Garnett, Paul Pierce, Jason Terry and Andrei Kirilenko. This season, the billionaire will spend around $103 million on salaries of basketball players. "I will be proud only when we win the championship race. For me there is only one place – the first place,” Prokhorov said. Billionaire Dmitry Rybolovlev, included in the list of the hundred richest people in the world by the magazine Forbes, bought the Monaco football club in December 2011. At the time of the signing with Rybolovlev, Monaco played in the second French division. The wealthy Russian made no secret that he is buying the club with expectations of its return to Europe's elite. Significant investments of the new owner (Rybolovlev promised “at least 100 million euros over the next four years”) allowed the club to invite Italian Claudio Ranieri as the head coach. Then, in the summer of 2013, Rybolovlev made several impressive transfers: Colombian striker Radamel Falcao, who was hunted by almost all the top clubs of the continent, was purchased from Madrid Atletico. In addition, Rybolovlev managed to lure to the team two leading midfielders of Portuguese Port, Hames Rodriguez and João Moutinho.